How long does it take an airplane to fly around the world without using any fuel? About 22 days of actual time in the air. This is just one of the many interesting takeaways from the upcoming completion of the first ever solar airplane circumnavigation of the planet, which will wrap up sometime Monday when the Solar Impulse 2 lands in Abu Dhabi. For over a year, two pilots have taken turns at the helm of the cutting-edge solar plane, navigating it through 17 different legs, including epic flights across the Atlantic and Pacific oceans—the latter of which took five days and nights of uninterrupted flying. Piloted by Swiss aviators Andre Borschberg and Bertrand Piccard, the arduous journey that was more than a decade in the making is aimed at building support for clean energy and a more sustainable future. 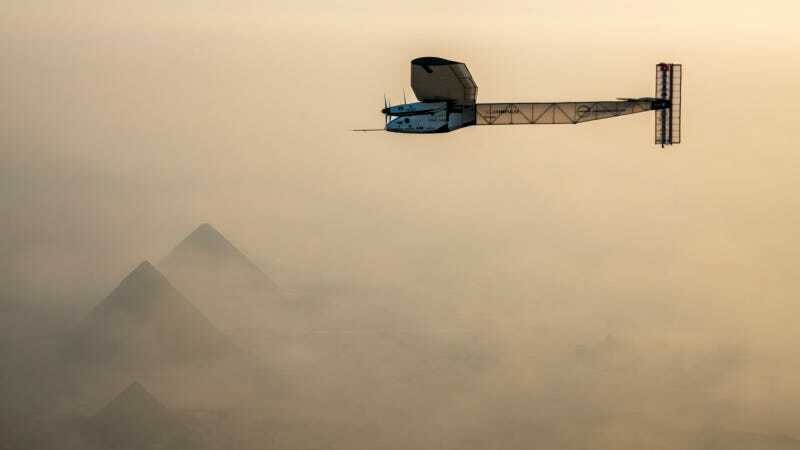 "The project is a big promotion of clean technologies around the world and the legacy of Solar Impulse is the created international community," Piccard told Reuters from Cairo where the final leg began. "I started to dream about this project 17 years ago in 1999 when I finished my hot-air balloon landing in Egypt, so 17 years later I take off where the balloon landed." In May, the Solar Impulse landed in Lehigh Valley, Pennsylvania. In lieu of traditional jet fuel, the Solar Impulse relies on four solar-powered engines that collect energy from more than 17,000 solar cells on its wings. It can fly through the night by storing some of the solar energy in batteries. The carbon-fiber plane has quite unusual proportions: Its wingspan is wider than a Boeing 747 and it weighs about as much as a car. The unheated and unpressurized cockpit can only fit one person at a time. Along the way to this historic milestone, the Solar Impulse broke at least 8 other world records, including becoming the first solar airplane to fly through the night and the first solar plane to cross the United States. Airplane flights account for 2% to 3% of domestic greenhouse gas emissions and about 2% of international emissions, however this percentage is likely to rise in coming decades as airline travel grows in popularity. According to the International Council on Clean Transportation, by 2050 the industry could contribute up to 15% of all anthropogenic greenhouse gas emissions if they continue to increase 4% annually.